My Toasted Sesame Ginger Salmon seasoning combines sesame seeds, ginger, garlic, sea salt, red pepper, and toasted sesame oil for a rich, spicy Asian flavor. It’s perfect for fresh salmon. 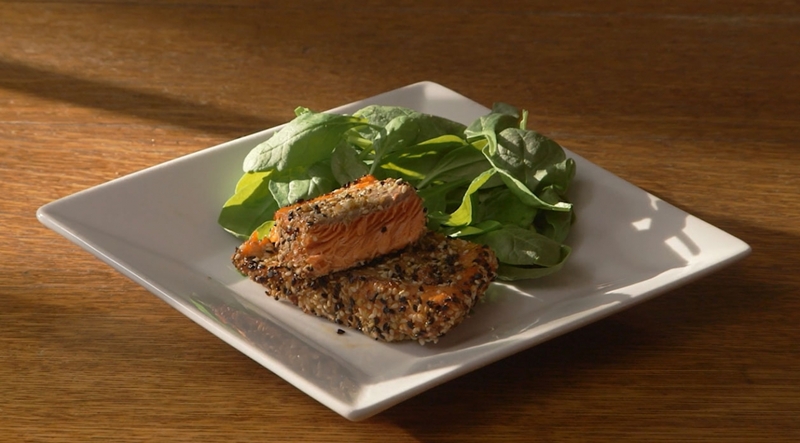 This recipe requires just two ingredients: salmon and my seasoning. Preheat your broiler to low. Then rinse four salmon fillets, about four to six ounces each, and pat them dry. Using three-quarters of the Toasted Sesame Ginger Salmon seasoning packet, coat the salmon on all sides except for the skin side. On a foil-covered pan, broil the salmon, skin side up, for two to three minutes. Turn off the broiler, set the oven to 350 degrees, and remove the salmon from the oven. 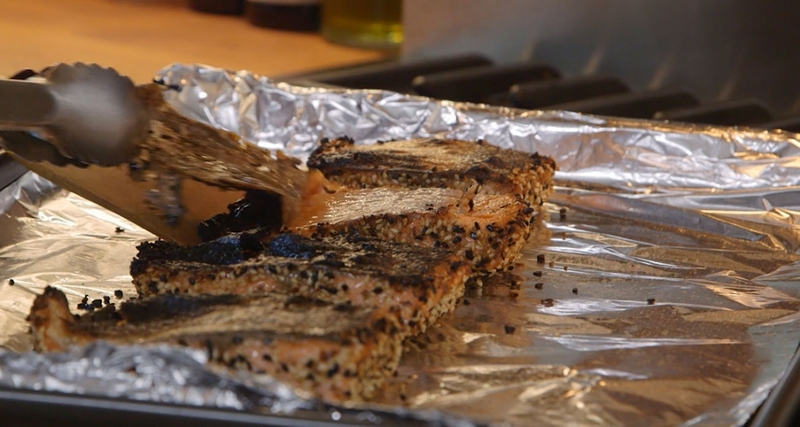 Here is the trick – remove the charred salmon skin using a pair of kitchen tongs. Discard the skin. Then sprinkle the remaining seasoning on top of the salmon and cook it for 20-30 minutes or until it is just pink through the middle. The bottom of the fillet will be a bit caramelized. And that’s my Toasted Sesame Ginger Salmon. It’s great with rice or on top of salad greens.